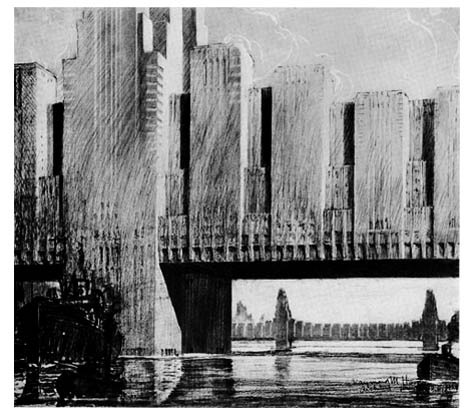 [Image: "Skyscraper Bridges" by Raymond Hood (1929), as seen in the project PDF for Rael San Fratello's Bay Line]. Transportation on the project seems to be neglected. The Bay Bridge is long enough that I don't think EVERYONE is going to be able to bike it. I think there should be space devoted to light rail. It also doesn't consider that out in the middle of the bay, the wind is strong, cold, and constant. It's going to be freezing up there! Not sure how the orchards and gardens will like it. Also, it doesn't seem to address seismic stability which is why the bridge is being replaced - it collapsed during the last earthquake. Certainly a thought provoking exercise, in any case. This and many other designs* are featured in the fascinating book Unbuilt America by Allison Sky and Michelle Stone.